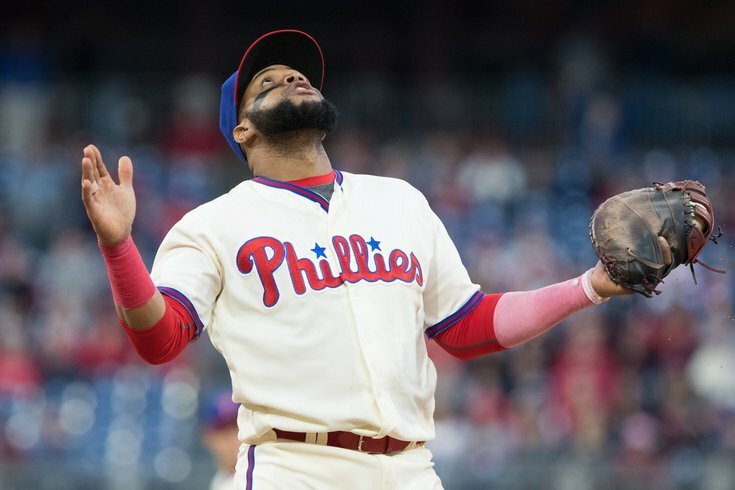 The Phillies were lucky to trade away Carlos Santana's gargantuan salary this past fall. The Flyers aren't the only Philly sports team with a identity problem. The club across the way at Citizens Bank Park is proving an enigma as well. The Phillies (16-13 overall) looked promising in April, finishing 15-10 for the month. Their April record was their best first month since they went 18-8 in 2011, the last season they made the playoffs. Now, a flagging offense – third in the majors with 288 strikeouts (behind San Diego, 315, and Texas, 297) and third-worst in the National League in average (.232) – has led to their recent spiral of four-straight losses. Even more disconcerting is the Phillies' 5-11 record against the National League East. They are 2-3 versus Miami, one of the worst teams in all of baseball, 0-2 vs. the New York Mets and 3-6 against a surprisingly good, young Atlanta Braves team. Manager Gabe Kapler, however, isn’t too worried about an offense that has produced a paltry 21 runs in the last seven days, which also ranks near the bottom of the National League. “We’re not getting the one good hit to knock the opposition out of the game,” Kapler told Angelo Cataldi and the 94.1 WIP Morning Team on Wednesday. “We’ve been getting people on base, but we’ve been in a little bit of a drought in those big moments. We’re smoking the baseball, but unfortunately, they’re right at people. What’s so baffling is this team dropped 20 runs on Miami three weeks ago, and followed that up with 10 against Tampa Bay. Regulars Odubel Herrera, Rhys Hoskins, Cesar Hernandez, Maikel Franco, Scott Kingery, Aaron Altherr and Carlos Santana have a cumulative batting average of around .247. The average is carried by Herrera (.337) and Hoskins (.301), and dragged down by free agent signee Santana’s .158. Santana started the season as the Phils’ No. 2 hitter, a pivotal spot in the order when it comes to analytics-driven teams. Santana has since been moved to fifth in the order. “First of all, we think the No. 2 hole is an important one, but [Santana] has helped us win a bunch of games,” Kapler said. “We think the fifth position in the lineup is a critical one. We also believe in mixing it a little bit with the hot hand makes a lot of sense. One of the exceptional things about [Santana] is the ability to use him in various spots in the lineup because of how flexible he is. Right now, this is a team searching for an identity, it seems. They’re 0-1 so far in May, but hopefully the month provided an opportunity for the team to take shape. But May hasn’t been good to the Phillies in a while. Their last five Mays have gone: 6-22 last year; 12-16 in 2016; 11-18 in 2015; 11-16 in 2014 and 14-14 in 2013. The last time the Phillies had a winning May was 2012, when they went 16-13. It’s also the last time the Phillies finished a season .500 or better (going 81-81).